Okay we didn’t break any law but it makes for a catchy title. 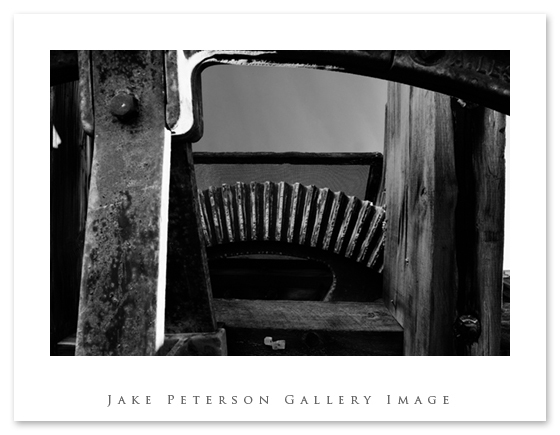 It seems i can’t go without posting a series of Black and Whites from a ghost town or rustic building. I JUST GOTTA! Something about the area that forces me to think in such dimensions. In this particular case i was playing around with a giant drill, at least i think it was a on old giant drill, looking up at the gears in the inside of it. I actually pointed the camera straight up underneath it, at different angles to get this first shot. It turned out kinda cool so i did what no photographer likes to do, i laid down and shot up. These other two were more selective but still fun. 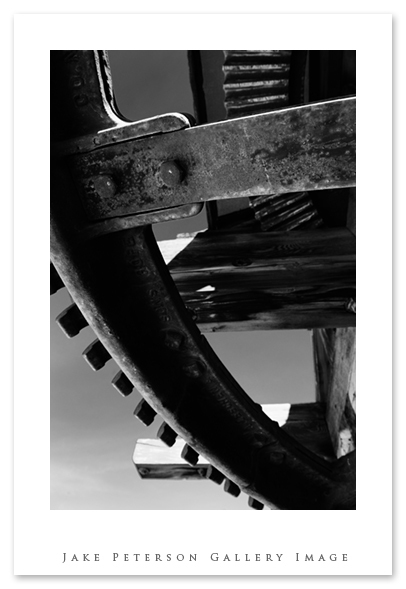 The whole idea is really the repetition in the gears and wood creating simple yet engaging patterns. I turned them into B&W’s because of the eerie feeling that comes from watching too many movies of old mine shafts and saw mills with zombies and ghouls and bodies getting cut in half, you know the typical horror youth stuff. What can i say I’m still a kid. Anyways, black and white is a useful tool to use but it can be over used, it is for sure not for every image. The trick as with any image is when it right to be used, when does it help communicate what needs to be said. 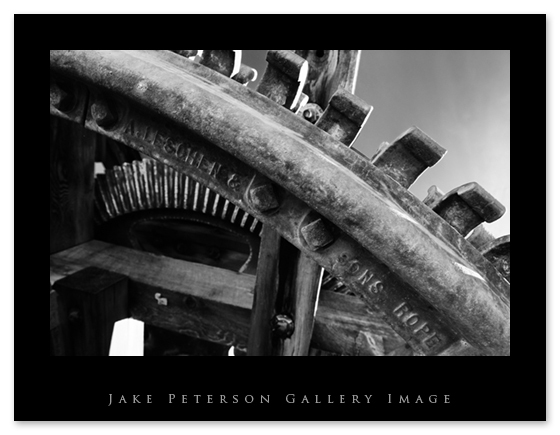 I chose it for these three because the gears are representing an old technology just like black and white photography was at one time the only type of images able to be captured. Now of course it also has to do with the simple fact that i just liked them with no color and saw them in my head before i took them that way. Just more to think and play with….hmmmm me thinking scary.